This isn’t a leaded stained glass tools wish list, that would be far longer! This page introduces you to the essential stained glass tools for the lead came technique and helps you decide which ones you really need. If you don’t want to choose and buy each item individually you can always buy a starter kit. This ready-made stained glass kits makes the whole process easy and is a great choice if you already have the tools for copper foiling and want to upgrade and give leading a try. There are different starter kits for Copper Foil and Leaded Stained Glass methods so make sure you choose the correct one. If you’re not sure which you need, you can read my review of each and find the best one for you here. I’d recommend an oil-filled cutter for all kits, simply because I don’t like the cutting stained glass without oil. They’ve all got the same tungsten carbide wheels, but I’d recommend Toyo cutters. I’ve used mine for years. (If you’re a fuser, it’s best not to use oil as it leaves greasy marks which can fire in permanently. )There are different shape cutters to suit different people. If you have trouble applying pressure with a pen-shaped cutter, you could try a pistol grip cutter. These pliers are specifically made for making stained glass. They remove any splinters of glass after the score line has been broken, or eat into sharply angled curves. A common but essential item in all stained glass kits. You can get away without a stained glass grinder if you are using the leaded stained glass construction method, as the lead came covers the edge of the glass and gives you a bit more leeway for error. Grinders DO make life easier though, and I would recommend one if your budget stretches to it. If you’re not sure which grinder go for, there are some grinder recommendations here. 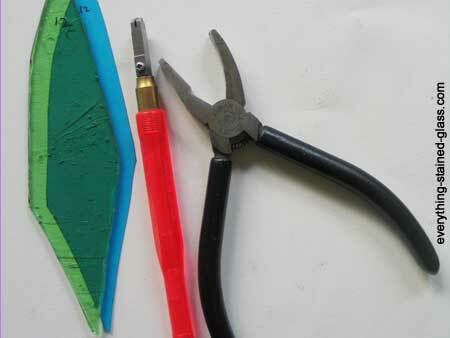 Your leaded stained glass tools kit has to include a lead knife so that you can cut and shape the lead came to size. These knives nicely weighted to bang in the horseshoe nails and they cut the came accurately. Keep them sharp for best results. You can also buy lead nippers, which are more like pliers. They’re easier to use and great for all but the very long, thin angles. This is an extremely useful, cheap plastic tool and essential for making leaded stained glass. It opens up the lead came before leading and presses them down after cementing. You can read more about it here. Holds the end of your 6ft lead came firmly so that you can stretch it before leading. There’s lots of expensive alternatives, but the most basic lead stretcher does the job of holding your lead while you stretch it. Just place the end of the lead came in the serrated jaws and pull with pliers. Comes in 6ft lengths or in spools. There are lots of different widths so choose carefully to suit your design. Be creative with your choice of lead came. Have a look at all the different widths and profiles available and choose the best one for making your panel stand out. You need at least a 100-watt soldering iron. They’re light, safe, flexible and – best of all – thermostatically controlled if you buy one 100 watt or above.This is an expensive and essential part of all stained glass kits, and worth spending some time thinking about. I have written a review page on the best soldering irons here if you are thinking of buying one. Use a flux – either a paste flux or tallow – to ensure the solder runs smoothly and sticks to the lead. This is essential, the solder will just roll off the lead if you don’t use it. Solder that’s 60% lead and 40% tin is standard for copper foil work and 50/50 is best for lead came work. Of course, you can solder lead with 60/40 too. It’s all to do with melting temperatures. The 60/40 runs smoothly and lends itself to foiling. This is the putty that you put under the lead came to make your panel strong and waterproof. You can save yourself a great deal of mess by buying ready-made black cement, or find out how to mix your own cheaply from my how to stain glass cementing tutorial here. Some people use sawdust – or talcum powder in times of dire need – but whiting powder (chalk dust) is the best. It doesn’t smell and cleans the black cement off brilliantly. Use a mask when you’re using this. Simply sprinkle the whiting powder on after you’ve pressed the putty under the lead. Use a brush and a bit of elbow grease to remove all the mess. It’s surprising how quickly it soaks it all up. Use a standard shoe brush to apply polish and blacken your lead came. This finishes your work off beautifully. Any outlet that sells stained glass art supplies will stock these essential tools. If there isn’t a store near you don’t worry, as there are many online stained glass suppliers that will ship all over the world. I’ve always found Amazon to stock everything and be very reliable and prompt. They stock just about everything you could possibly think of. The only down side is trying not to resist all the unnecessary delights available! If you stick to the list above you should be ok. So now you know what tools are needed to make up a decent stained glass kit you might want to have a look at my free how to make stained glass tutorials. They start right from the beginning and take you through each step, with useful photos and videos. Hi, love your website. The starter kit on this page with the Weller solder iron takes us to a kit on Amazon at £12.99, but this is not the correct kit. Any chance you could update us with the correct link. Thanks. I’m afraid these kits aren’t available in the UK. The link takes you to what it thinks is the nearest item which – as you say – is all wrong! If you’re wanting a starter kit Tempsford Stained Glass sell some good ones. Make sure it’s one that includes a Weller 100 iron. Thanks for your question and apologies for the frustration.